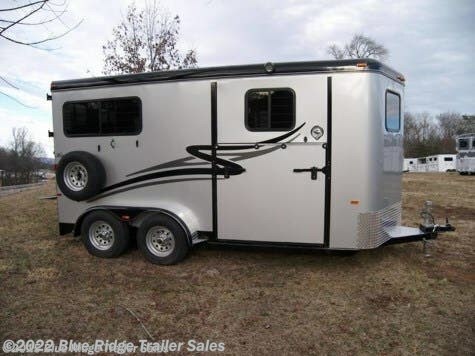 Horse Trailer - 2019 Hawk Trailers 2H BP with Side Ramp & Dress 7'6" x6'8"
Click to visit Blue Ridge Trailer Sales website! 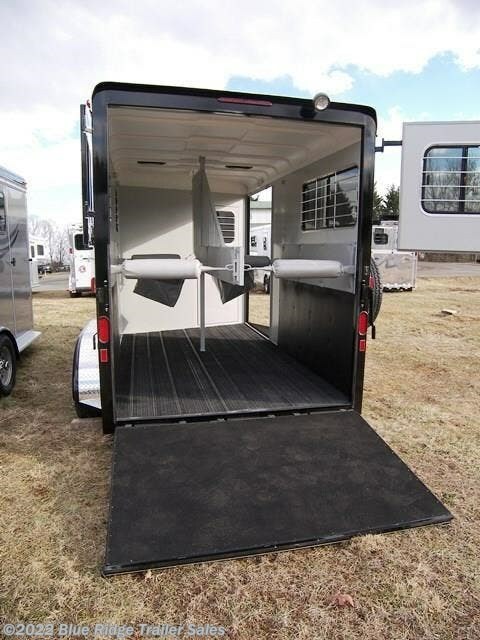 Floorplan 2H BP with Side Ramp & Dress 7'6" x6'8"
2019 Hawk 2H BP w/Side Ramp and Dress, 7'6"x6'8", Silver, Rumber Flooring, Washable flooring in dress, 1 Escape Door, Rear Ramp w/Curtain Doors, windows in Curtain Doors, Window in Dress Wall, Tubular Head & Shoulder Divider, Loading Light over both Ramps, Spare Tire, Saddle Racks, Bridle Racks. 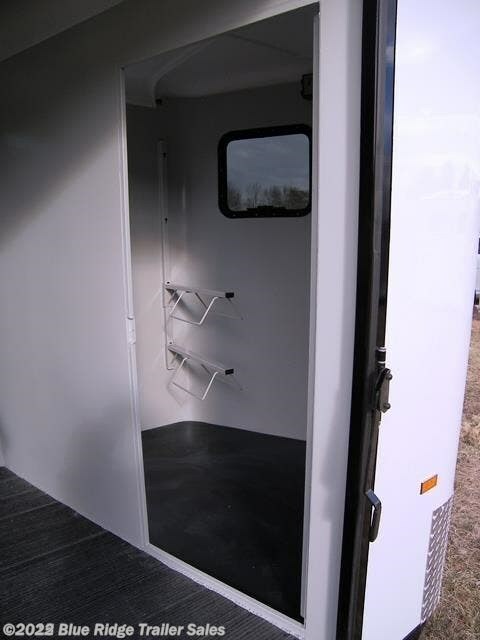 GVWR 7000, Empty 3700, Carry 3300. 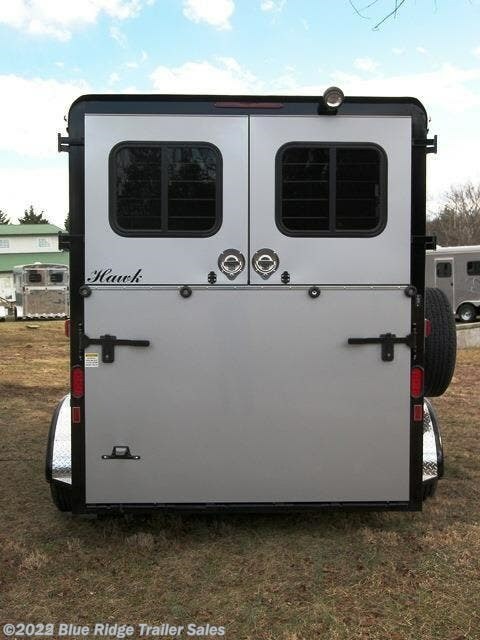 Horse Trailer - 2019 Hawk Trailers 2H BP w/Dress 7'6" x 6'8"
Horse Trailer - 2019 Hawk Trailers 2H GN wSide Ramp and Dress 7'6"x6'8"
Horse Trailer - 2019 Hawk Trailers 2+1 GN with Dress 7'6"x6'8"
Horse Trailer - 2019 Hawk Trailers 2H BP w/Dress 7'6"x6'8"
Horse Trailer - 2019 Hawk Trailers 2H GN w/Dress 7'6"x6'8"
Horse Trailer - 2019 Hawk Trailers 2+1 GN with Side Ramp 7'6"x6'8"
Horse Trailer - 2016 Delta 12' GN w/4' Dress Stock Trailer 7'x6'8"
Horse Trailer - 2019 River Valley 2+1 GN w/Dress 7'6"x6'8"
Horse Trailer - 2011 Brenderup Baron LTC 2H BP w/Tack Compartment 7'6"x5'6"
Horse Trailer - 2019 River Valley 2H BP w/dress and side ramp 7'6"x6'8"
Horse Trailer - 2019 River Valley 2H BP with 3' Dress 7'6 x6'8"